This is an album (boy that’s dating me, ain’t it) I recorded “live” in Nashville at Belmont College in 1977. Several things you might take note of—first off the pianist is Beegie Adair, then a session player and now a recognized jazz pianist nationwide. Second, three of the songs—”My Finest Hour”, “Ain’t It the Gospel Truth” and “Words and Music”—were later recorded by my pal Cynthia Clawson; this helped reinforce my instinct about the songs I had chosen to record. Third, the strings, voices and organ were added in the studio later. We tried to make it sound like it was “live” but it wasn’t. And fourth, I still perform some of these same songs today, even after all this time. I wrote this several years ago as a poem after being thoroughly captivated by the brilliant colors of the Fall foliage in New England during an visit there. Later on I decided to add a melody and then later still I did this recording in California—mostly for fun. So now I’m sharing it because, well, it’s October. His Story … My Songs. 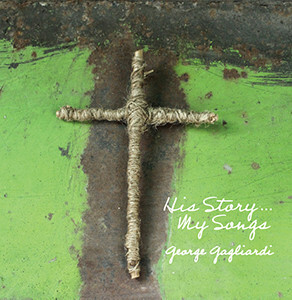 George’s most recent recording, His Story … My Songs, is a very personal musical portrait of Jesus built around George’s original songs. Recorded live in 2014, it features a vocal quintet, string quartet, jazz quartet and guest vocalist Michael Prysock. This recording is available for free. You can listen to the full tracks and download them individually through the Soundcloud player below, or you can download the entire recording, including artwork, as a zipped file (link below). Mac users: File should unzip automatically when download is finished. Windows users: For help click here. Somebody Ought to Record That! Recorded live in January, 2013, this collection features George performing his original songs with a host of special guests, including the noted singer Cynthia Clawson, who appears on several tracks. Other performers include vocalists Shannon Monk and Lynn Adler, saxophonist Mark McKenzie and his jazz quartet (featuring George on piano and guitar), trumpeter Bert Truax, and a string quartet. The 19 tracks are varied in style and instrumentation. The CD can be purchased by contacting George directly. You can listen to a sample of each track below. This CD is a live recording of a solo concert from January, 2011 that featured George on vocals, piano and guitar performing his original songs. None of the songs heard that evening had been performed publicly before. The CD can be purchased by contacting George directly. You can listen to a sample of each track below. Recorded live at Wilshire Baptist Church in 2003, this collection of original songs can be purchased directly from George. You can listen to a sample of each track below.